I thought it was time I update you on my skin progress with the African Extract range. The most important thing you guys need to understand about this range is that it's for dry skin. It helps reduce your dark marks and blemishes and has an anti-shine formula. I cannot stress this enough, if you have dry skin and suffer from dark marks and blemished this product is NOT for you. This range is perfect for people with oily skin as it removes impurities and tightens you pores. If you have dry skin and you try this product it will only dry out your skin further and that isn't something you want, moisture is key for healthy skin. I used the five products that you see above and I must admit that I have my favourites, I believe in exfoliating at least two or three times a week so the wash, scrub and mask with bio-active Rooibos and baobab extract is amazing. 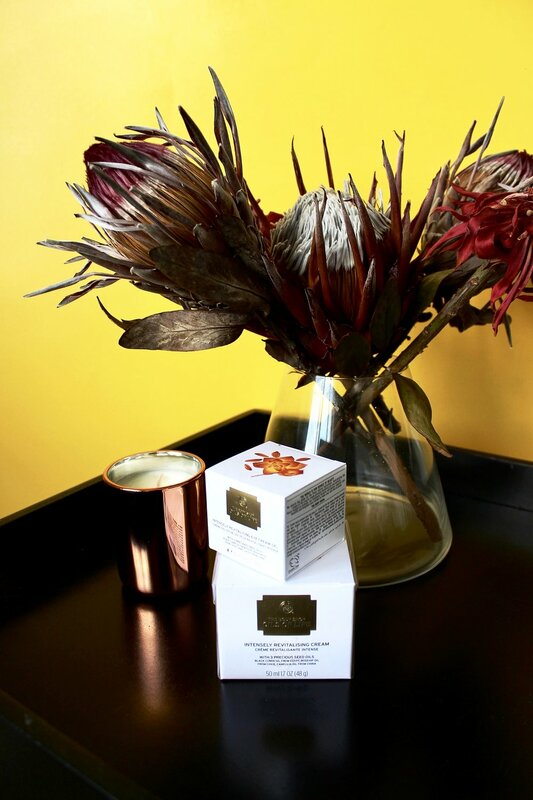 The Rooibos purifying vanishing cream with baobab is another favourite of mine, I used this product at night and it helps with those pesky dark marks. In the pictures above I just started using the range and as the weeks went by it unclogged my pours, I had less breakouts, my skin became more matte and the imperfections started clearing up. I used to feel very insecure when hitting the gym because I don't usually wear makeup while working out but this has definitely changed. I never wear makeup to gym anymore and it doesn't bother me in the slightest. The picture below I literally just took today before heading to gym, I hope you guys can see the improvement in my skin, I surely do and I'm extremely happy with the results. This range is extremely affordable and you can find it at places like Clicks, I do once again have to stress the fact that if you do have dry skin this range isn't for you. Good luck with your skin journeys my lovelies! I hope you get the same results I did. If you'd like to find out more about the range you can check out the #Purifyyourskin #skinlovesrooibos #africanextracts on Instagram. My skin journey just like so many other people's is a daunting one, it goes up and down and one can never just seem to find a solution, until now. A few months ago I went on holiday to Bali and upon return my entire chin and and cheek areas broke out with massive pimples that were quite painful. Like a gift sent from the heavens I was approached by The Wembley Medispa to try one of the peels and I was more than willing. At this point I would have tried anything as my breakout wasn't clearing up at all. I set up a consultation ASAP and then went in to meet the team. The therapist that treated me is Tasneem, she did an amazing job in making me feel extremely comfortable. We then discussed that I would need to do a series of three different peels to get my skin back to a healthy state. These peels are all non-evasive and you're able to go back to your daily life the very next day. After the consultation we then proceeded to start the process of the first peel. Below is what my skin looked like before we started the peel. The first we did peel was called a Beta Plus treatment. The Beta Plus formulation it’s effective for the removal of black and whiteheads as well as congestion. It’s also extremely anti-inflammatory and will calm aggressive inflammatory reactions in inflammatory acne. There are two concentrations of this treatment, Beta Plus 15% and 20% and both are applied in the same way. With my peel the Beta Plus 15% was used. After the treatment my skin will felt hydrated, plump and glowing. A little redness is normal – especially if you have active papules and pustules (pimples). This will resolve within a few hours or the following day. The very next morning I had already noticed a dramatic change, all the pimples on my chin and cheek were reduced significantly in size. I was extremely impressed with the results and at the end of the 4 weeks before my second peel, all my pimples had cleared except for a tiny on that was left on my chin. I was blown away by the results. Protect your skin by avoiding sun exposure and apply your sunscreen every morning. No treatments for 14 days on the treated area. This includes waxing, peels and laser or IPL treatments and micro needling. Do not exfoliate for 10 days after the treatment. This includes toners and cleansers that contain alpha hydroxy acids. Do not pick your skin. Allow extracted areas time to heal. Only start using your retinoid (Vitamin A) containing products on the evening of day six after the treatment. By the time we did the second peel, all my pimples had vanished except for one. I was so impressed and excited by the results, I couldn't wait to do the second peel. It was four weeks after my first one and the day finally came in which I had to do my second peel. I once again visited The Wembley Medispa and Tasneem did her magic. The second peel was a Beta Peel treatment, it is used for its effect on the lipid found in the corneum of the skin. This self-neutralising formulation is also effective in black and whiteheads and congestion. There are three concentrations of this treatment, Beta Peel 15%. Beta Peel 20% and Beta Peel 30%. The latter is only performed in skin care units where there is a doctor involved. 15% was used during my treatment. During this peel there was a bit of tingling but the sensation didn't last very long and the fanning that Tasneem proceeded to do during the process really helped to subside the slight burning sensation. This treatment will cause some dryness of skin and flaking. I didn't experience too much dryness of the skin, I was quite happy with the results. The treatment is completed with moisturiser and sunscreen application. With the third peel Tasneem used one layer application of Beta 20% with the use of retinol 0.3%. We went slightly stronger with this one as I wanted to peel more with the final treatment. In cases where more flaking is required the skin care therapist might decide to add Retinol to your treatment. This might be done in skin where the pigmentation is resistant to treatment or where the skin is not peeling adequately to see results. The initial Beta Peel treatment is the same, the after care products (moisturiser and sunscreen) are however replaced by the application of Retinol 0,3 serum. This needs to be left in place for 8 to 12 hours. With the final peel I experienced way more peeling compared to the second one, I was happier to do a stronger peel for my final visit. Below is an image of my skin before I had the very first peel done and the second image was right after the third peel was done. I was extremely impressed with the results and would absolutely recommend any and very one having problems with their skin to go for a consultation and have The Wembley Medispa help you reach your skin goals. It's now been just over 2 months since my last peel and I skin as stayed healthy and hasn't had any breakouts since, other than for the odd pimple here and there. My skin is healthier, smoother and pimple free. I would like to continue this process and get rid of all my pigmentation problems, it is suggested that you have a peel at least once a month to main the skin. Here's to all our skin journeys and getting glowing and healthy skin. Here's to all our skin journeys and having glowing and healthy skin! For those of you that know me, you know that I've always loved and admired long and lushes hair, therefore, I am so terribly excited to let you guys know that you and I now too can have long and lushes hair and it's all thanks to CLIPINHAIR. I discovered CLIPINHAIR quite some time ago but it wasn't until about a month ago when I received my very own set of clip in human hair extensions. As you can see I opted for the longest and fullest bundle. I also chose an ombre grey because I've wanted grey hair for the longest time and that was finally possible. I have to 220g which consists of about 8 different pieces, I have already worn them all at once but I tend to use about 6 pieces most of the time. Once I wore them for the first time I was hooked, they weren't heavy or uncomfortable. They style so easily and it stays in throughout the day. 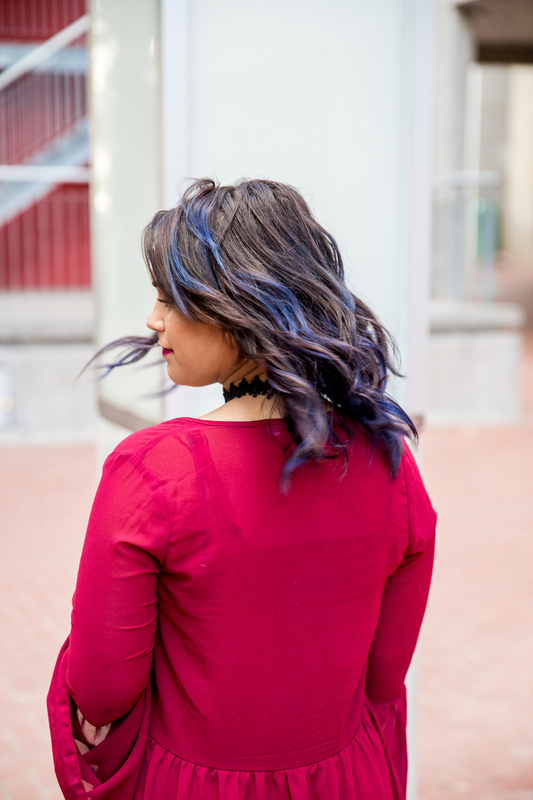 I would steer away from using products on the extensions and heat style it as little as possible in order to ensure they last and always look healthy. Maintenance of your extensions is not a difficult job at all, whenever I remove them I comb each piece out and place them all together neatly in the box I received them in. This seems to work perfectly. Lastly, I love that they give you the option to wear them or remove them. I don't exactly know how I would always manage with 220g of hair on my head hehe. If you're looking to extend your locks, these are definitely worth a try. If you're after length or volume, CLIPINHAIR will have something for you. TRESemme’ has launched their new reverse wash system, first you condition and then you shampoo. The new Beauty-full volume range is aimed at soft touchable volume, the range consists of four different beauty-full volume products but there are three of them that are essential to your wash. There is a flexible volume hairspray as well but I don’t think that it will be launching in South Africa with the rest of the products. A few weeks ago I attended the launch and we had the privilege of seeing celebrity hairstylist Chris Neselli in action, he is a TRESemme’ ambassador and head stylist at New York Fashion Week. He demonstrated four different looks on four different models whose hair was prepared with the beauty-full volume range and what a beauty-full outcome it had. When starting with these products below you’ll find the order in which they are to be used. Using conditioner after you shampoo can weigh down your hair and leave it flat. This is exactly the dilemma I’ve been dealing with because we need conditioner. The TRESemme’ Beauty-full Volume Pre-Wash Conditioner is designer to be used before you shampoo your hair; it leaves the hair smooth and polished but still full of bounce. Washing your hair after conditioning gives your hair a lighter feel, it doesn’t feel weighed down or oily. It leaves it softer and more touchable with the new reverse wash system; it gives your hair more body and bounce. The maximizer is for bouncy and touchable volume, usually volumising products leave hair feeling stiff and sticky and this product does not. 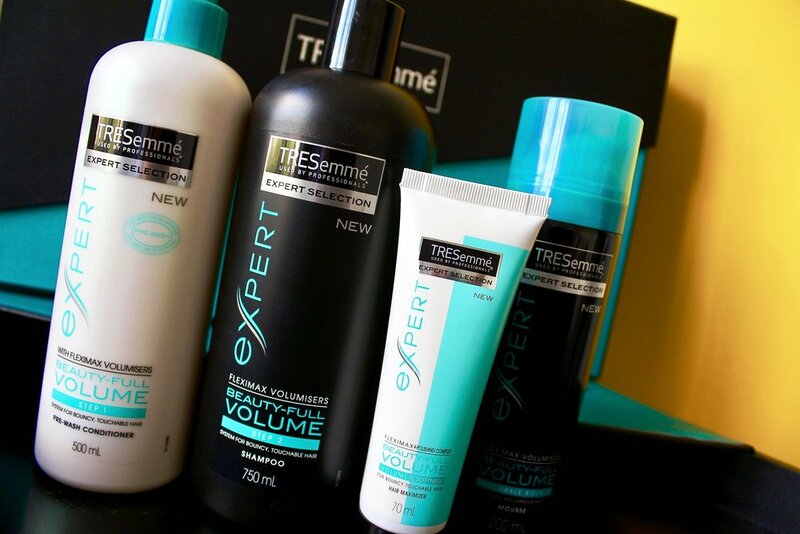 This is the significant difference between the TRESemme’ Beauty-full Volume range and all the other volume products out there. This product gives you that extra lift if you’re looking for something more than just the lift you’ll already get from the maximize. You’ll have hair with beautiful body that still feels soft and touchable. This is definitely a win-win. These products are available at all leading retailers and it’s been the only thing I’ve been using since I received the samples about two months ago. It’s definitely something you want to try especially if you have fine and flat hair or really heavy hair. Trust me you won’t be disappointed. I hope you’ve all been doing well; I’ve been so busy lately I haven’t had a moment to snap. Today I want to tell you guys about the Pretty Posse Kit, it is a kit made by the one and only Beauty Blender. 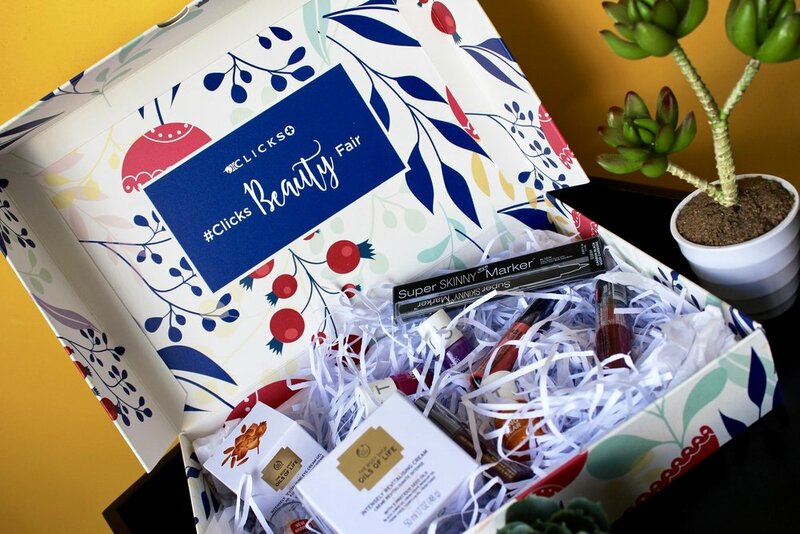 It contains five really fabulous products and I’ll be taking you guys though them now. The item I’m most excited is the Original Beautyblender, this is the first reusable edgeless makeup egg. When you wet it the egg doubles in size and this reduces significantly the amount of product that is absorbed by the egg. The egg is latex free and hypoallergenic; it lasts much long than the dupes that most of us buy, which tends to start chipping and cracking after a few washes. I’ve read that if cared for properly the BeautyBlender can last up to over a year; these have been in reviews from other beauty bloggers and their personal experience with it. The BeautyBlender has a flawless application, remember to dab and not wipe. You can use it with foundation, powder, bb cream, cream blush and so much more. Secondly we Micro Mini BeautyBlender, this is just the cutest thing I’ve ever seen. It’s exactly the same as the original blender but it’s much small in size and a bright green in colour. 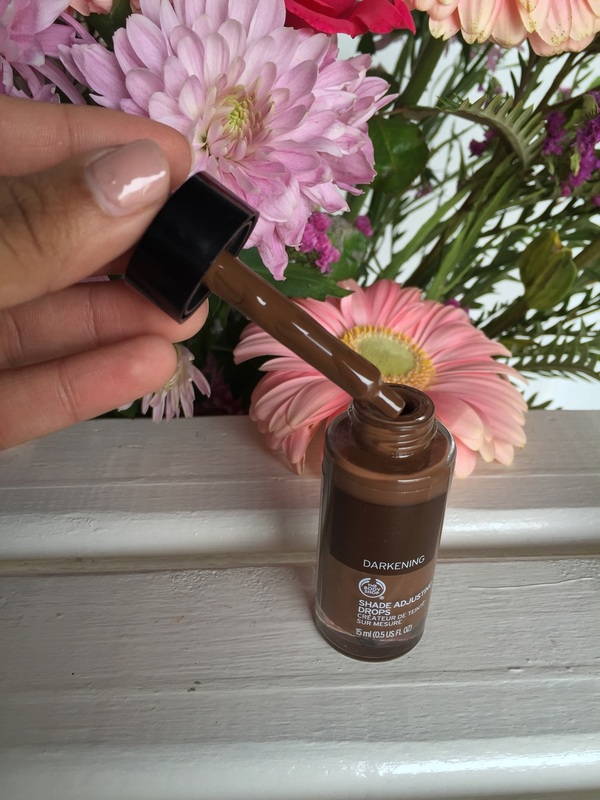 This is absolutely perfect for getting into tighter spots, like under the eye and under the brow. You can use it for contouring, highlighting and concealing; its sharp edging is so precise so it’s amazing for focusing in on certain areas. Then we have the BeautyBlender bling ring, this is an item I can appreciate because whenever I clean my blenders and leave them to air dry you always find that one little wet spot on the section where it was resting. The bling ring is basically a stand for your BeautyBlender to be stored when you’re not using it and for it to dry on when you’re done washing it. Fourthly is we have the BeautyBlender solid (in the kit you receive a mini), this is a soap to keep your blender clean and in top shape. You could also use this to clean your day to day makeup brushes. This cleanser is made to extend the life of your BeautyBlender, it is perfect for removing heavy pigmented areas on your blender or brushes. Last but certainly not least we have the BeautyBlender rea.active spray, this is used to rehydrate your blender when you’re on the move or travelling. I quite love this because there’s nothing worse than a hard BeautyBlender against your skin. It also doesn’t work as well when not hydrated. These items aren’t all sold separately, in order to get some of them you would have to by the kit as a whole. To purchase any of the Beauty Blender products check out their website HERE. A list of stockist around South Africa can be found HERE. I have finally reached the end of my Schwarzkopf journey. It has been quite a few months of changes when it came to my hair colour but thanks to the new Live Colour XXL range Schwarzkopf has made the transition easy for me and even easier for my hair. I don't know if I'm able to choose which my favourite look was but I have to admit I've got a huge response when posting my first picture of the Pillar Box Red look. A lot of my readers preffered this colour over the previous two and in a sense I do too. These pictures were taken two weeks after I coloured my hair and as you can see it's still as vibrant as ever. If you'd like to see some of the first pictures you can check out the #jjbxlivecolourxxl on Instagram. Look out for my final post where I'll be combinding all three looks and give you guys the final breakdown of my experience with the Schwarzkopf Live Colour XXL. Dove has relaunched its core Dove Nutritive Solutions range, this range focuses on progressive nourishment thus igniting a conversation around the relationship women have with their hair. It has a new look and feel with many significant enhancements to the product formula. Like any relationship, developing a long term positive relationship with your hair takes time, commitment and trust. The goal of Dove Nutritive solutions is to drive the concept of long term results from progressive nourishment. Therefore Dove Nutritive Solutions will provide you with the short term result of hair repair through shine and smelling fresh with long term benefits from progressive nourishment. Dove has been committed to helping women build a loving long term relationship with their hair that makes them feel confident and is a source of happiness. Naturally women have a special relationship with their hair and like any relationship, it takes and commitment to develop a healthy one. You have to invest in the relationship if you want it to be a strong, loving and lasting relationship. I know exactly what this feels like and my relationship with my hair started ever since I was about 8 years old. I could never style it myself and after years of practice and getting to know which products works best for me, I finally (sort of) understand my hair. Dove has always been a nourishing influence through my hair journey and I can’t wait to try the new enhanced Nutritive Solutions. My relationship with my hair is now one of understanding what it needs and what works best for it. Stand a chance to win 1 of 5 Dove Nutritive Solutions by telling me what type of relationship you have with your hair. Is it an ongoing battle or a relationship of commitment and love? Winner will be announced on the 23rd of March 2016 on my Twitter & Facebook account (justjadeblog). As most of you know I’ve been an avid user of Lipidol products and I had previously told you briefly about each one of the seven products made available by them, you can read all about them in my previous post over HERE. 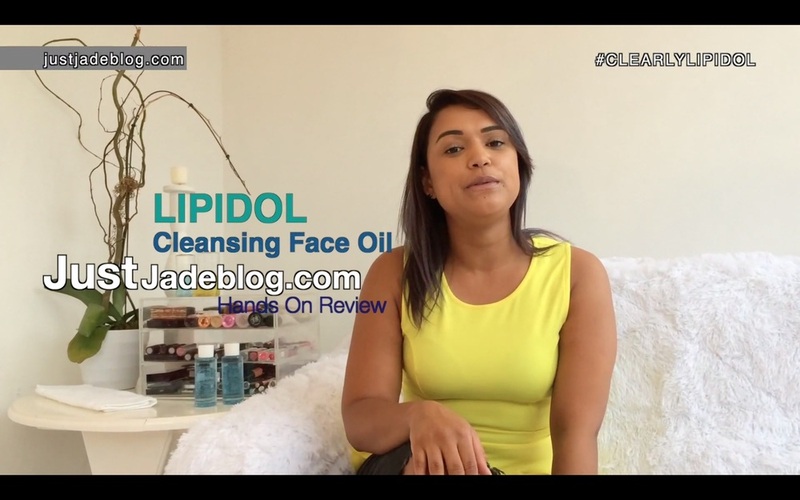 Today however I’ll be focusing on the Lipidol cleansing face oil, this cleansing oil is not only something to wash your face with in the traditional sense but it is an amazing makeup remover as well. Oil based products are definitely new to the beauty market and it’s creating quite the stir, with Lipidol being 100% natural it is totally safe for the skin and doesn’t remove or damage the lipid layer of your skin while cleansing. I have been using this product for a while and have to admit I haven’t come across anything that removes my makeup (waterproof mascara included) as well as this oil does. Using the cleansing face oil is a simple procedure. All you have to do is pour some of the oil into your dry hands and rub it onto your face. Once you’ve massaged the cleansing oil onto your face, the oil binds with all the makeup and dirt. You then add some water and the oil emulsifies and turns into a white milky liquid. Once this happens you can start rinsing. Make sure that you rinse thoroughly and finally dab your face dry with a towel. The cleansing face oil leaves your face feeling smooth, hydrated and doesn’t leave behind an oily residue. For only R79, 95 I would recommend this product to anyone and everyone, it’s definitely worth a try! Check the #ClearlyLipidol to follow other posts. It's been exactly a month since my last post. Things have been hectic and quiet at the same time, we've been through New Years and I hope all of you are sticking to the resolutions you made. I know that most of you are following my Schwarzkopf Live Colour journey and what a fun journey it's been so far. For those of you that haven't, I am using the Schwarzkopf Live Colour and dying my hair all three colours over a certain period of time. A month ago I started out with purple, check the previous post with all the details here. As you guys can see I am now on the blue. I applied the Electric Blue about three weeks ago, the vibrancy if the colour has lasted quite long even. The blue initially came out darker than it was supposed to because of my hair being previously purple. I thought I loved the way my hair looked when I coloured it the first time but I love the blue even more and I'm hoping to keep it for the full 15 washes. Next up we have Red, it's definitely something to look forward to. Change is always good but I might just come back to the Electric Blue once the Red washes out. Today will be my first post of four about my journey with Schwarzkopf Live Colour XXL. Let me tell you right off the back that I am so impressed with this range of semi-permanent hair colour. The month of December is the first month that Live Color XXL Ultra colourful shades have reached South African shores and just in time for summer. 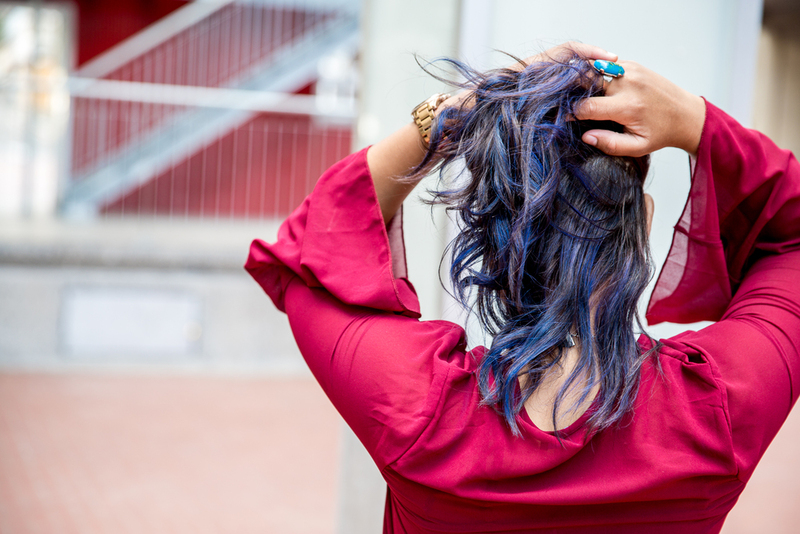 This new exciting vibrant and colourful range include 3 variants, namely: Electric Blue, Purple Punk and Pillar Box Red which have Ultra Bright pigments, leaving you with an electrifying, bright and colourful hair colour as can be seen in my pictures below. The range has been created to last up to 15 washes, the pictures seen below were done after 3 washes, and this shows you how well the colour holds. The vibrancy doesn’t come easy for dark hair so therefore I lightened the ends of my hair to receive the effect I wanted. I would like to thank Best Laser Skin Hair for lightening my hair for me. Live’s HD-Vibrant Pigment Technology intensively saturates each hair strand with high definition colour especially on pre-lightened hair. Perfect for pre lightened hair or adding tone to existing colours, or just refreshing existing shades. The texture of the colour itself has a thicker paste in order to give you an easy controlled application. These colours also come pre-mixed, eliminating the mess and fuss when preparing for application. Simply just apply and wait! These can be mixed with shampoo for a less intense colouring or to help boost a colour once it’s been applied. 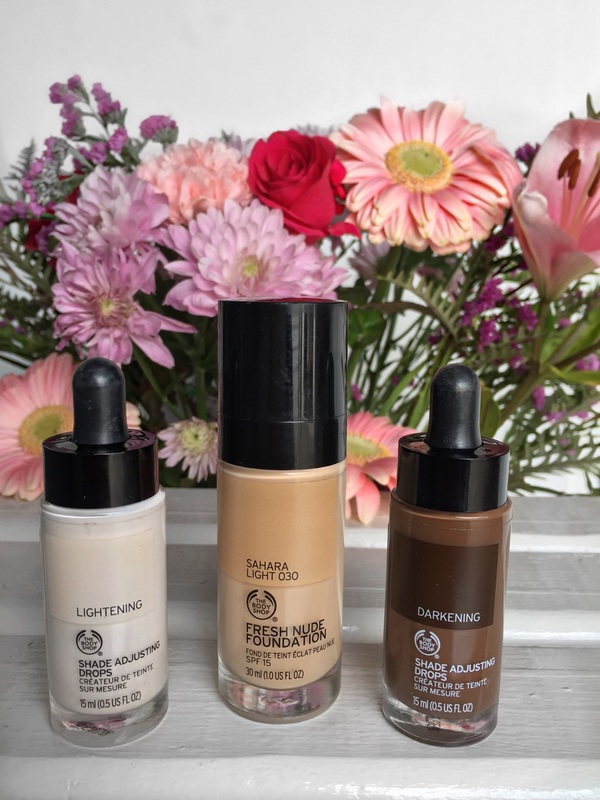 Its multiple application techniques means it’s perfect to help you customise your look. 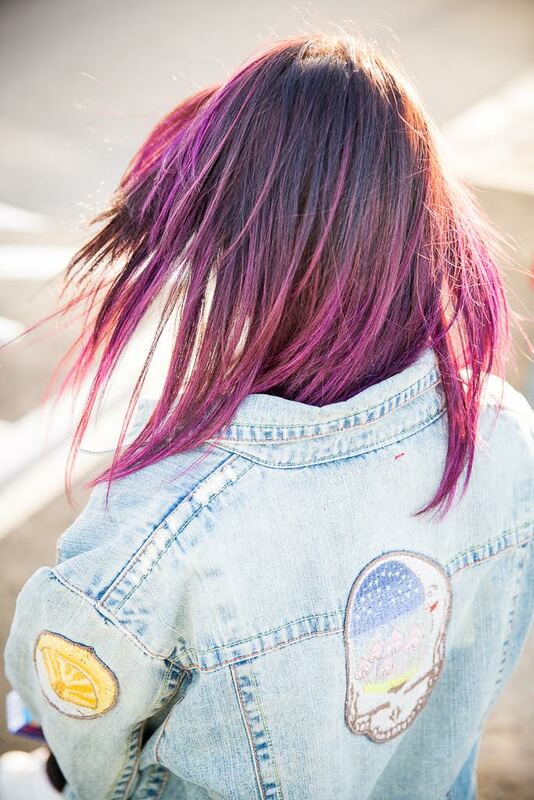 From a daring full head application to a subtle on-trend dip-dye, streaks, pastels or just adding a hint of colour and easily created from the comfort of your own home. Colouring your hair with semi-permanent colour also causes minimal damage and leaves your hair healthy and shiny, remember to use a mask weekly for best the results. 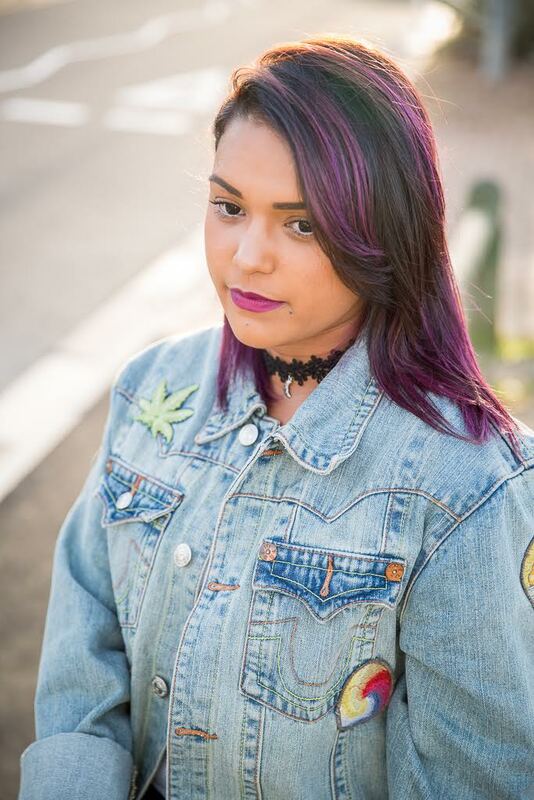 I’ve been loving my purple hair and can’t wait to try out the rest of the colours. These can be found at Clicks stores and go for only R95 a box! 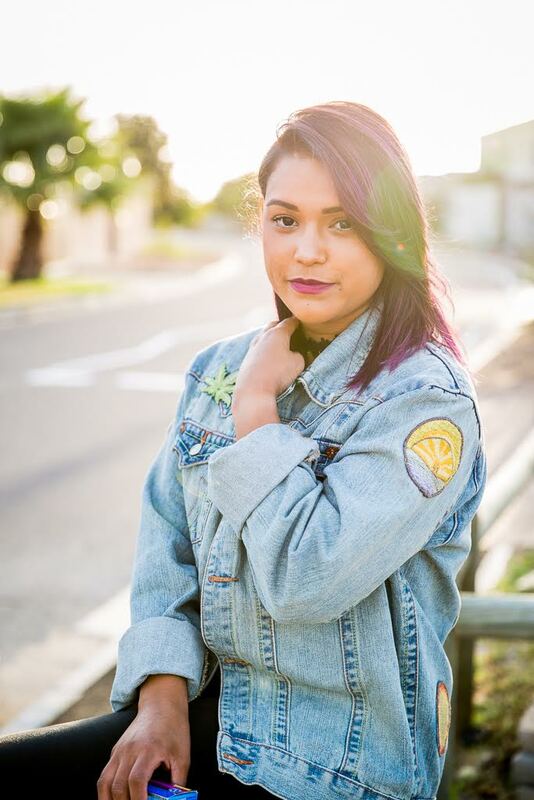 So choose a colour or two or three and change up your look this summer, tag me on Instagram (handle: @justjadeblog and #JJBxLIVECOLOUR) so I can see all your awesome looks. As most of you know just over two months ago I flew to Johannesburg for the Dove #KnowYourHair launch, some of you must have seen the snaps, Instagram, Twitter/Facebook posts. The event was quite amazing, we had a great time and before we caught our flights back to Cape Town Dove gifted us with the new Advanced Hair Series range. We learnt all about the new Advanced Hair Series range at the event but I decided to take it home and use it before doing a blog post about these products. So as I mentioned before, it's been over two months now. The first month I used the Oxygen Moisture range, I thought that this range would be best for my hair type because it's for women with fine and flat hair. My hair is fine and gets flat and oily after a day of washing it. The advanced formula in the Dove Oxygen Moisture range allows women seeking volume to achieve beautifully moisturised hair with 95% more body and fullness. I found that the Oxygen range did exactly what it promised, it moisturised my hair but kept it light and fluffy. I don't know if this is what I preferred though because my hair felt too light and I found it a bit tough to style or to keep it straight. The volume was outstanding and the the smell is amazing too. This is a great product but it's just not the best product for me. If your hair's like mine and you're looking for the light softness this is perfect for you, I just prefer a little weight to my hair. After the first month I changed it up and started using the Dove Pure Care Dry Oil range. The Dove Pure Care Dry Oils range uses fine, pure drops of botanical oils including African Macadamia Oil and is scientifically proven to nourish the hair internally, as well as nourishing the hair’s surface to deliver 5x Silkier hair. This range is for women with dry, dull hair. Once again the smell and texture of the product was amazing and I loved that this range came with an extra product - the dry oil hair mask. I was impressed from the first wash, I loved how shiny and moisturised my hair was and I also loved that it had volume but wasn't too soft or fluffy. I went on to use the mask once a week for the next month, I loved the result each time and discovered that I was a PURE CARE DRY OIL kind of woman and not OYXGEN MOISTURE (which I initially would have assumed I was). I think that every woman out there is either OXYGEN or PURE CARE woman and I suggest that you give them both a try and discover for yourself which one you are. I’ve never done a “favourites” blog post yet so I thought this would be the perfect opportunity to do one and the fact that I am totally obsessed with a whole bunch of products right now kind of helped it along. I’ve been meaning to share these with you guys for a while now but it seems I can’t bring myself to stop using them and actually just sit down and do a post about them. I tried to focus more on cosmetic products because these can basically be used by anyone, whereas other beauty products are more personalised to a person and do need a more in depth explanation. I am soooo obsessed with this Primer; I’ve been using it for about a month now. The texture is smooth and has a cooling effect. This primer is amazing for hydration; it is moisturizing but doesn’t make the skin oily. This is amazing for all skin types, your skin will soak it right up, this primer also doubles as filler so those wrinkles and creases under the eyes are nothing to bother about. 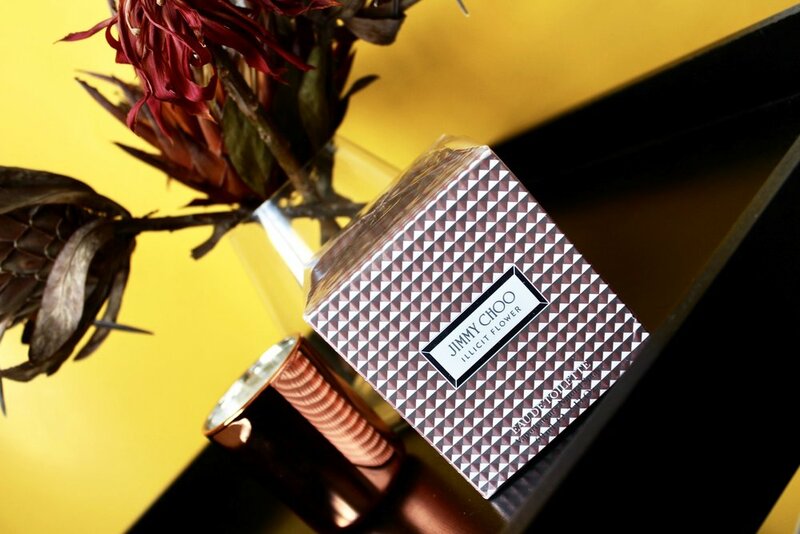 The packaging is simple and durable and the price is even better at R279.00, this is definitely a must try and buy! This could be my favourite out of all my favourites this month. The LA Girl Concealer is a gift from above; it is a medium to full coverage concealer depending on how you use it. The packaging is in a squeeze tube but the little brush on the end makes the application so easy. It covers blemishes and dark circles. 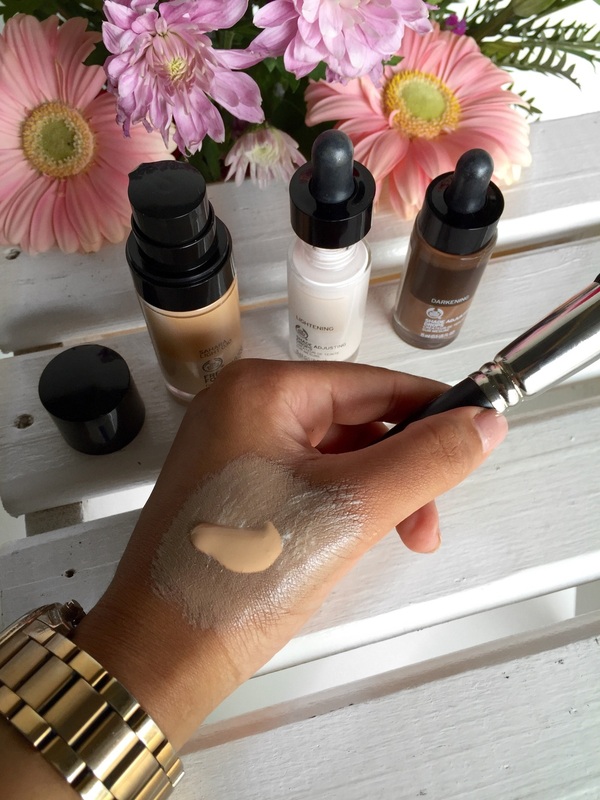 The concealer is hydrating and you just need to use a little to get the desired coverage you need. The concealer comes in 18 shades so there’s one for all of you out there and last but not least is the mind blowing price of R44.95!!! (They can be found at Dischem stores). The Brow Zing Kit consists of a soft, pigmented wax that defines and shapes brows and a color complementing powder to keep them looking wow, a hard angle brush, a blending brush and a pair of tweezers for pesky hairs. The hard angled brush and the powder does the best job of outlining my brows and the wax and blending brush keeps the hairs in place and fills them out perfectly. I haven’t come across a better brow kit and for just over R300 it’s definitely worth it. I’ve received this recently so I only used it a hand full of times but I can’t rave enough about the results. I went out this past Sunday and the temperatures outside were quite warm, I sprayed on some hydration mist before leaving the house and my makeup stayed in place the entire day. My selfie game was quite strong, my skin looked extremely smooth all day long and no foundation or concealer touch up was needed. I’ve been obsessed with the Flormar Revolution Lipstick ever since they landed on SA’s shores. This month I love the shade Violet – Code R02, the revolution lipstick has always had amazing pigment and vibrancy in the shades. It’s super moisturizing and enriched with shea, Olive, Cocoa and Olive butter as well as orchid complex and anti-oxidants. It has long lasting qualities but I always find that reapplication is needed after I eat. The lipstick goes for R149 and is well worth it. I was recently using the Bene Brow which is amazing but switched over to this when I received and preferred it out of the two. 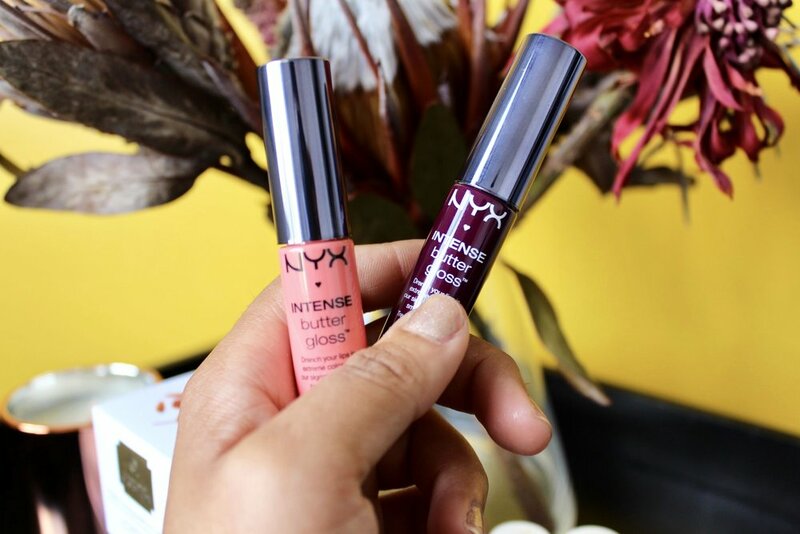 The application is easy and never messes, the tint dries quickly and gives the desired effect. Why I chose this over the Bene Brow is because the colour is more vivid. I love everything about this product; it gives your skin the best shimmery glow. I love wearing it on my cheeks as well as my décolletage area. This product is extremely long lasting and never needs a second application. It can also be used as a highlighter and to set your makeup. A definite must try for everyone! Benefit’s new kid on the block, Roller Lash, is standing toe to toe against their world’s number one selling mascara. However there is a difference between the two and it comes down to personal taste or preference. The Roller Lash is a curling mascara but the formula is just as amazing than that of the They’re Real mascara. If you’re looking for vava voom and don’t mind a straight lash too much then you’re definitely a They’re Real girl. If a curled lash is what you want then Roller Lash is for you. This product is amazing! It is a natural highlighter for all skin tones; the highlighter comes off in a champagne colour with soft pink and beige undertones. The packaging is electrifying and is imitated after a little light saber. It has the highlighter on one end and a little application sponge on the other. I love the application sponge because not only is it hygienic it helps tone down the highlighter. Right off the back TanOrganic stands out from your usual self-tanning products, this is due to the fact that they only use natural ingredients. These ingredients include Aloe Vera, argon oil and avocado just to name a few. There are no synthetic colours, fragrances or parabens. TanOrganic is the only eco-friendly tanning brand in the world and this literally means that the products are produced from seed to bottle. The product is so easy to use. You pour some of it into your hand and apply it as evenly as possible all over the desired areas. It is however advised that you wipe your hands with a baby-wipe afterwards to avoid the oil tanning your hands. TanOrganic takes about 2-4 hours to develop (in my experience) but wait a 6-8 hours as recommended to get the full effect. It leaves a really healthy look to the skin. This product doesn’t have much of a downside to it other than the oil being clear, because it is clear it doesn’t give you much of an indication on whether you’re applying it evenly or not. So during application, one has to be extra careful. I was supposed to do a Valentine’s Day trial and review on TanOrganic but I received the products two days before and thought that it wouldn’t be the best review after a mere two days. I started applying the product on the 12th February and some more on the 13th leading up to Ultra Music Festival. I tend to tan my legs before these big festivals and I was surprised to see that the tanning oil had already improved the colour in my legs. I’m one of those people that has that crappy shorts tan so I tend to self tan the top part of my leg which seems to be lighter than the rest of it. I was both surprised and impressed to find that TanOrganic made a huge improvement after just two days. My legs were ready for Ultra and my skin tone was even. This product is for anyone and everyone, it doesn’t only provide colour but also focuses on moisturizing the skin. The more I used it the better the results were day after day, just be sure not to overdo it and make your tan too dark. Thanks to TanOrganic for giving me my new favourite tanning product and making my Ultra, ultra fantastic! Hey dolls, I hope you're doing well. 2015 is upon us and the time for celebrating has come to an end. You find yourself slowly falling back into the routine that we all love so much. Before everyone hurries off and starts 2015, I would like to take a moment to reflect and share one of my experiences of 2014. As you all may have noticed I’ve changed my hair and I love the new, shorter and more vibrant look. This is all thanks to a stylist named Flo. 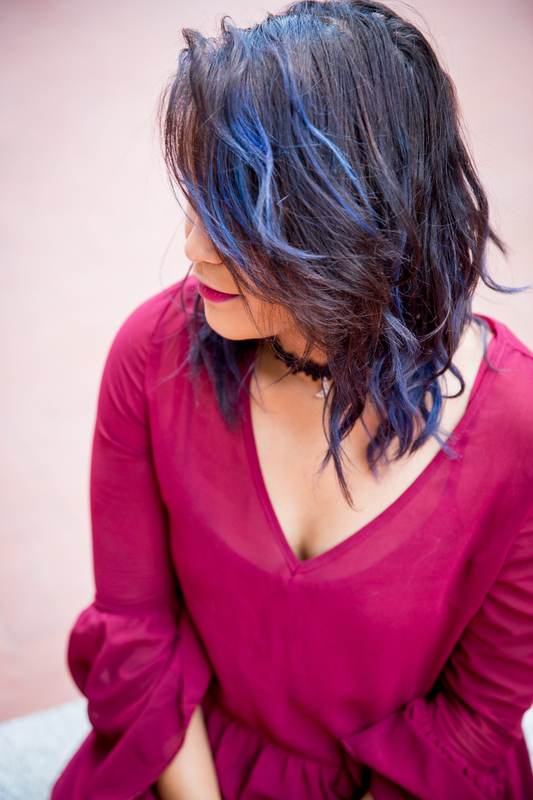 Flo is an amazing stylist with many years of experience. Originally from Romania, he came to SA about three years ago and was a stylist at Scar before eventually venturing off to open his very own salon, ‘Excentric’. Excentric is based in Seapoint main road (85 Regent Road). Excentric opened their doors on the 5th September 2014, with a modern look, amazing staff and a world class stylist. I was certain this salon was heading straight to the top. This was proven to be true a mere two months after Excentric had opened their doors. 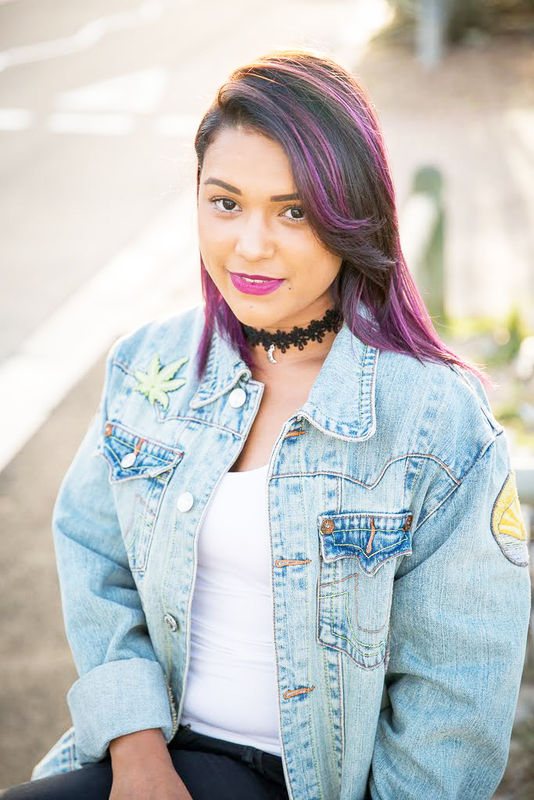 They were ranked 5th in the Top 10 hairdressers in Cape Town according to Cape Town Magazine. My experience at Excentric was one of luxury and comfort. I was offered everything from a vanilla latte to champagne. The staff were professional and so pleasant. I could tell from the get go that Flo knew exactly what he was doing putting me right at ease and allowing me to give him the creative freedom to do what he clearly does best. Excentric offers a range of services and products that can be bought in store. They recently added a nail technician to their team, Wayne. Wayne is known to give amazing mani pedis! One client, who asked to be quoted anonymously, described his pedicure as orgasmic haha! My first time was so great I went back again and this time I took Hishaam with me. He was just as impressed as I was and had a haircut and manicure done while he waited for my five hour colour treatment to be completed (shame, a 5 hour wait. I really felt for him.). The second time around my natural hair was turned into a warmer brown colour and the red was made more fiery and vibrant (loved it!). Excentric is currently running a special which involves you sharing the secret about the salon with a friend of yours. By bringing your friend to the salon; you and the friend will receive a R100 off any treatment or R200 off any colour treatment! So go to the salon telling them I shared the secret with you and show them the voucher below and you’ll receive a discount off the treatment of your choice. This is an amazing special so don’t miss out on it! As you can see there is much to experience at Excentric so take the time to make an appointment with Flo, Lisa or Wayne you won’t be disappointed. Their operating hours are from Monday to Friday 9am – 6pm, Saturdays 9am – 4pm and Sundays can be requested for weddings or special events. For a full list of services including hair, nails and coffee bar please click here.